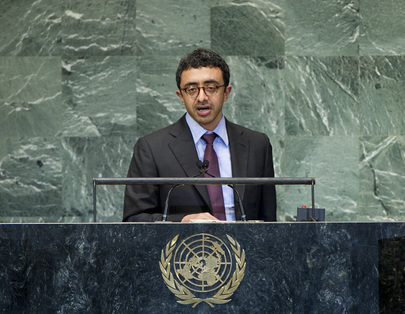 ABDULLAH BIN ZAYED AL NAHYAN, Minister for Foreign Affairs of the United Arab Emirates, expressed regret over Iran’s continuing occupation of its three islands — Abu Musa, Greater Tunb and Lesser Tunb — and demanded full respect for its sovereignty over them. “All actions and measures taken by the Iranian occupation authorities are null and void, contrary to international law and to all norms and common human values”, he said, calling on the international community to urge Iran to respond to his country’s repeated, peaceful and sincere calls for a just settlement of that issue, either through direct and serious negotiations or referral to the International Court of Justice. Deeply concerned by the escalating violence, killings and displacements perpetrated by the Syrian regime against its own people, he called upon the international community to stop the heinous tragedies committed against Syrians, noting that the solution to the crisis would only be achieved through an orderly transition of power. He urged all States to contribute to humanitarian efforts, adding that his country would continue to provide relief to Syrians in Turkey and Jordan. As for the wider Middle East, he said peace and stability could not be achieved without resolving the Arab-Israeli conflict and ending Israel’s occupation of Palestinian and other Arab lands. It must withdraw from East Jerusalem, the occupied Syrian Golan and the remaining occupied Lebanese territories to the lines of 4 June 1967. He hailed the completion of Somalia’s transition, the convening of its Constituent Assembly, the adoption of its Constitution and the election of its new President, and reaffirmed support for the country’s sovereignty, territorial integrity and political independence. The Emirates also remained committed to supporting the security and stability of Afghanistan, and would continue to provide it with humanitarian and developmental support. He expressed his deep concern about the violence perpetrated against the Rohingya Muslim community in Myanmar, calling upon the international community to urge that country’s Government to stop all acts inconsistent with human rights principles. Reaffirming his country’s commitment to nuclear non-proliferation, he reiterated its support for turning the Middle East, including the Gulf region, into a zone free of weapons of mass destruction. The United Arab Emirates demanded that Israel join the NPT and subject its nuclear facilities to the comprehensive safeguards system. He also called for Iran’s full cooperation with the IAEA, to implement its international commitments to ensure the programme’s transparency, and to dispel all fears and suspicions surrounding it. He said his country had begun developing a nuclear energy programme for peaceful uses in 2009, in order to meet growing demand and to support economic development projects, while ensuring that its rules and regulations were based on the highest safety and security standards and non-proliferation principles.